Advantages: latest design of Norzon grain; high strength paper support; self-adhesive pad; improved reduction speed for higher productivity; prolonged product life; reduces curling; tear-resistant; prevents premature clogging, strong and improved grain adhesion; fast and easy disk change. 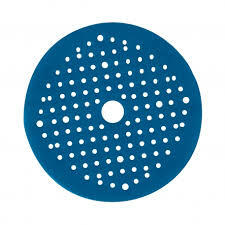 These discs have a grain range P40-60-80-120. Multi-Air discs with Norzon technology combine the latest grain design and sturdy paper base with an optimized multi-air mesh configuration. They are effective for quickly removing old paint layers, smoothing the body filler, flattening edges and large surfaces.